In Woodbury, VT, the Pledge of Allegiance, something that students have said for years, was not being recited for reasons unknown. Efforts to have the Pledge restored have brought controversy. In 1943, the U.S. Supreme Court ruled that schoolchildren could opt out of saying the Pledge for religious reasons (…one nation under God). I was unaware of that ruling…and in the middle of WWII, no less. Regardless, the move to reinstitute the Pledge of Allegiance is tearing apart little Woodbury, VT (pop/810). The controversy seems to hinge on when and where the children should say the Pledge. A sixth grade student has been going around from class to class to gather those who wished to say the Pledge. They would then go up wooden steps to an old gym to recite the Pledge of Allegiance. The controversy now is that isn’t good enough. Many parents feel this is disruptive of the classroom routine and the Pledge should be recited where it has for generations; in the classroom. Last Friday, the routine changed again. ALL students were gathered into a cramped foyer and the Pledge was recited. I have to say, this is ridiculous. An interesting read. I like your style. dtech, appreciate the kind comment. Thanks for dropping by. Hey, David I did a post on this same subject on my site on the same day you did. Pretty cool. I like your take on it as well. And, yes, P.C. has gone too far in this country. Great post. Matt, I did not know you made a similar post! Great minds, etc., etc. Thanks for coming by! Hi David. I'm the one behind the pro-Pledge movement in Woodbury, Vermont. I appreciate your post. 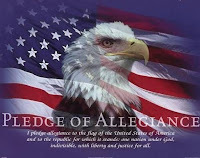 My blog addrress is SaveThePledgeOfAllegiance.blogspot.com where you can get lots more info and contact e-mail addresses and phone numbers. Best wishes, Ted Tedesco.